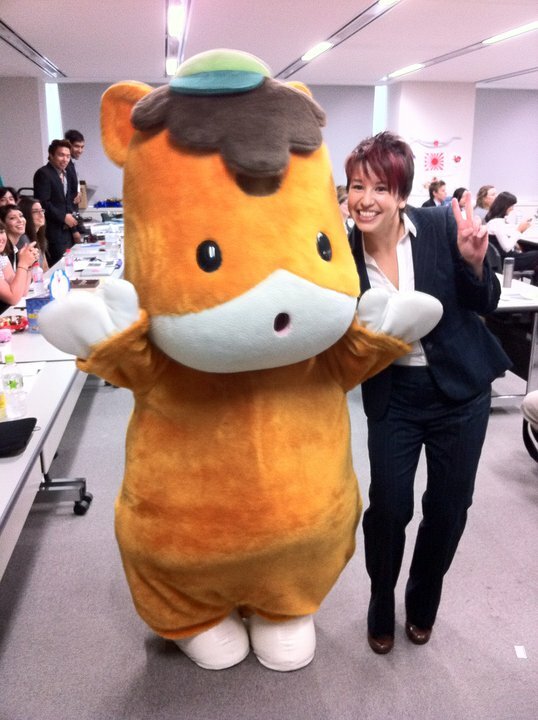 The Many Faces of Gunma Chan — Gunma Orientation! Late last week we had a 2 day orientation for the new participants of JET Program here in Gunma. There were new faces from all over the world–North Americans, South Africans, Austrailians, New Zealanders, Singaporeans and more were there to learn all about their new lives in the prefecture we call home. There were presentations on all kinds of practical topics, as well as hands-on cultural workshops about music, martial arts, and traditional arts. There was a fancy Welcome Reception, attended by some prefectural bigwigs, as well as a very informal (but well attended!) Karaoke night. Overall it was a lot of work, but a lot of fun. It’s a great chance to get to know both new and old faces. Not every prefecture has the resources to do something like this, so I felt very lucky to participate! There was one major highlight of the two days, for me at least. 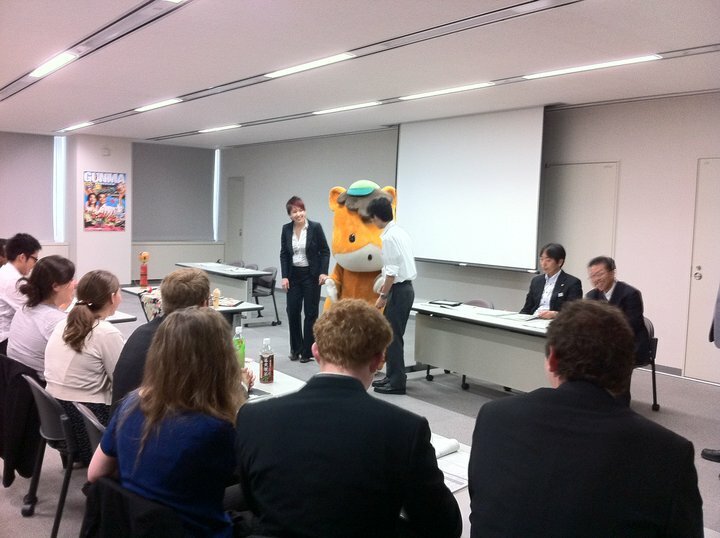 We had a very special guest show up the morning of the first day…Gunma-chan! For a brief moment, I felt about 5 years old. 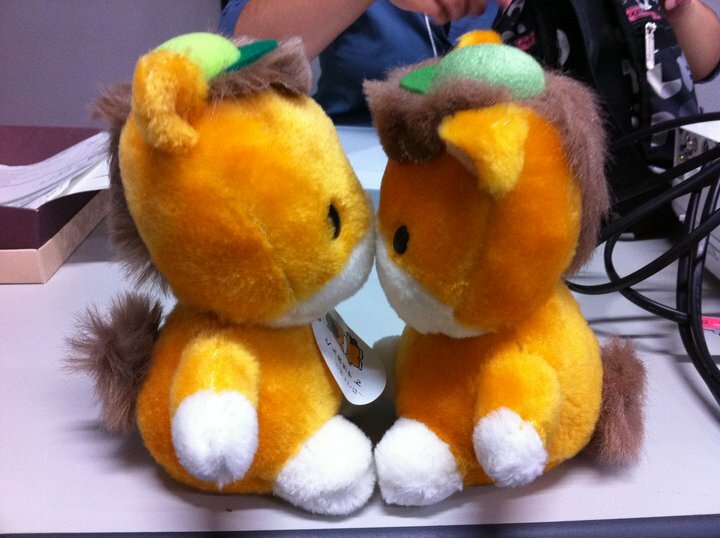 I think everyone enjoyed the visit, and I noticed a number of the new ALTs picked up plushies of all sizes from the building’s gift shop. I’m glad to see a new crop of Gunma-chan fans being made! This entry was posted in Gunma and tagged Gunma, Gunma chan, Jet Program. Bookmark the permalink. 1 Response to The Many Faces of Gunma Chan — Gunma Orientation!